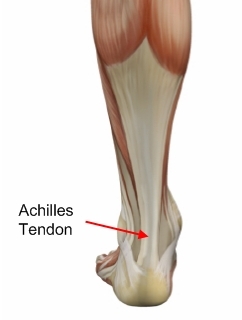 Achilles tendon injuries are one of the most common overuse injuries in recreational sports. A very small percentage of these injuries are diagnosed and treated by doctors of chiropractic. What is especially interesting is that a high percentage of these injuries are caused by a posterior calcaneus subluxation. Pain anywhere along the tendon, but most often on or close to the heel. Swelling of the skin over the tendon, associated with warmth, redness and tenderness. Pain on rising up on the toes and pain with pushing off on the toes. If you are unable to stand on your toes you may have ruptured the tendon. This requires urgent medical attention. A painful heel for the first few minutes of walking after waking up in the morning. Stiffness of the ankle, which often improves with mild activity. The first thing to do is to cut back your training. If you are working out twice a day, change to once a day and take one or two days off per week. If you are working out every day cut back to every other day and decrease your mileage. Training modification is essential to treatment of this potentially long lasting problem. You should also cut back on hill work and speed work. Post running ice may also help. Be sure to avoid excessive stretching. The first phase of healing should be accompanied by relative rest, which doesn’t necessarily mean stopping running, but as I am emphasizing, a cut back in training. If this does not help quickly, consider the use of a 1/4 inch heel lift can also help. Do not start worrying if you will become dependent on this, concentrate on getting rid of the pain. Don’t walk barefoot around your house, avoid excessively flat shoes, such as “sneakers”, tennis shoes, cross trainers, etc. In office treatment would initially consist of the use of the physical therapy modalities of electrical stimulation, (HVGS, high voltage galvanic stimulation), and ultrasound. Your sports medicine physician should also carefully check your shoes. A heel lift can also be used and control of excessive pronation by taping can also be incorporated into a program of achilles tendonitis rehabilitation therapy. Orthotics with a small heel lift are often helpful. If non-surgical treatment fails to cure the condition then surgery can be considered. This is more likely to be the case if the pain has been present for six months or more. The nature of the surgery depends if you have insertional, or non-insertional disease. In non-insertional tendonosis the damaged tendon is thinned and cleaned. The damage is then repaired. If there is extensive damage one of the tendons which moves your big toe (the flexor hallucis longus) may be used to reinforce the damaged Achilles tendon. In insertional tendonosis there is often rubbing of the tendon by a prominent part of the heel bone. This bone is removed. In removing the bone the attachment of the tendon to the bone may be weakened. In these cases the attachment of the tendon to the bone may need to be reinforced with sutures and bone anchors. So what are some of the things you can do to help prevent Achilles Tendinitis? Warm Up properly: A good warm up is essential in getting the body ready for any activity. A well structured warm up will prepare your heart, lungs, muscles, joints and your mind for strenuous activity. Balancing Exercises, Any activity that challenges your ability to balance, and keep your balance, will help what’s called proprioception, your body’s ability to know where its limbs are at any given time. Plyometric Training, Plyometric drills include jumping, skipping, bounding, and hopping type activities. These explosive types of exercises help to condition and prepare the muscles, tendons and ligaments in the lower leg and ankle joint. Footwear, Be aware of the importance of good footwear. A good pair of shoes will help to keep your ankles stable, provide adequate cushioning, and support your foot and lower leg during the running or walking motion. Cool Down properly, Just as important as warming up, a proper cool down will not only help speed recovery, but gives your body time to make the transition from exercise to rest. Rest, as most cases of Achilles tendinitis are caused by overuse, rest is probably the single biggest factor in preventing Achilles injury. Avoid over training, get plenty of rest; and prevent Achilles tendinitis.